I rapidly flick from planet to planet, routing warheads around like packages at Christmas, to be delivered to all the naughty boys and girls who trespass on my planets. I'm also meticulously optimizing my rebuilding. With the clock around 13:30 and an impending CPA (sure to be gigantic at this AIP) so close I can smell the rocket fuel, I have little margin for error in how I handle the next 30-60 minutes. I could potentially wait until the last moment when I have as much of my fleet rebuilt as possible, and bet it all on taking Kochab in one last attack. But if that fails, I'm likely not going to get a second chance. The better choice is a one-two combo, with each punch staggered about 20 minutes apart. The first wave will be a fast-moving, low-cost suicide squad of Bombers, Teleraiders, and Infiltrators, supported by warheads. Their goal will be to eliminate the Raid Engine, last Arachnid post, OMD, and if possible, the Core Muni post before losing structural integrity. Between the warheads and their speed, I'm hoping they'll be able to evade the partially-rebuilt SF and Reserve. If that fails, then I have no choice but to wait for the heavy-hitting starships to rebuild and bet it all on one final strike around the 14 hour mark. If they succeed, I'll have time to rebuild them in time to coincide with the critical starships being ready -- namely, the Mk.II+ Protectors, Corvettes, Plasma Siege, Heavy Bombers, and Neinzuls. I'll squeeze anything else in that I have time for, but those will be the core of my final strike, a battering ram powerful enough that it should smash through the Core FFs sitting on top of White's home command before whatever defenses the AI can call up can destroy them all. There will also be another trio of Armored warheads and a final Nuke. There is no such thing as overkill, only "insufficient force" and "target destroyed". The Nuke will destroy most of the SF, which will likely be rebuilt fully by the 14 hour mark. One of the Armored warheads will take the H/K if it has one. The other two will accompany the fleet onto Kochab, where one will bypass the two Core FFs guarding the Muni post, finally stripping the last source of immunity from the command station. The last warhead will bypass the FFs parked on the station, and potentially do enough damage to peel them back far enough that the station is exposed. If not, the starship hammer backed by fleet-bombers will flatten whatever's left with overwhelming brute force -- I have zero concern for subtletey at this point. The suicide squad is ready on Alioth. Te morituri salutamus! The raid is as brief as is it violent, but they achieve every goal aside from the Muni post, which they do manage to damage. Acceptable. The Knights respond by shifting the rally point of the SF to Kochab, castling their remaining king on the board. I will nuke you again. A Massive AI Ship Is Inbound To Your Planets (3960) -- oh man that better not be what I think it is. Another exo fires from Kochab somewhere in here and smashes itself on either Nekkar or Pi Mensae. A wave hit Pi Mensae somewhere along the way as well. Wezen was attacked by threatfleet but barely held it off thanks to my last warhead parked out here, manual turret control, and piling Engies on the FFs. Speaking of FFs, something somewhere in here counted coup on my home command on Vega -- the 6-7 FFs are all damaged into the yellow, but the command station underneath is untouched. I am singularly unpleased. Also puzzled. I presume it was something from the Exo, because nothing else should have tried to skip combat on the chokepoints when fired upon. But I have 4 layers of undestroyed FFs sitting on top of the wormholes to Vega on both Nekkar and Pi Mensae, which should have kept anything other than Vampire Claws and Raidstars from coming through. I also have Mk.II Military command stations on them, plus the matching module on Vega, which will decloak anything stealthed, which should have revealed and punted either of those two FF-bypassers. None of those three command stations were harmed also, which makes no sense if it was Raidstars in Exo-based "hunt the CC mode". A single note on the Wiki mentions Teleraiders "due to their nature" can skip defenses on wormholes. Having exhausted all other possibilities, whatever is left, no matter how improbable, must be the correct answer. Apparently I just encountered a very specific edge case interaction between FFs, wormholes, and Teleraiders. I mentally add them to the list of things to immediately go corrupt no matter what it takes if seen in enemy hands along with Spire Railclusters, Eyebots, and Zombards. The southern Doomfleet turns around to chew on the harmless wreckage of the turrets on Hadar and Alpha Centauri some more. I'm actually holding off scrapping them purely because they're serving oddly well as bait to keep distracting this now 40,000 strength nightmare. 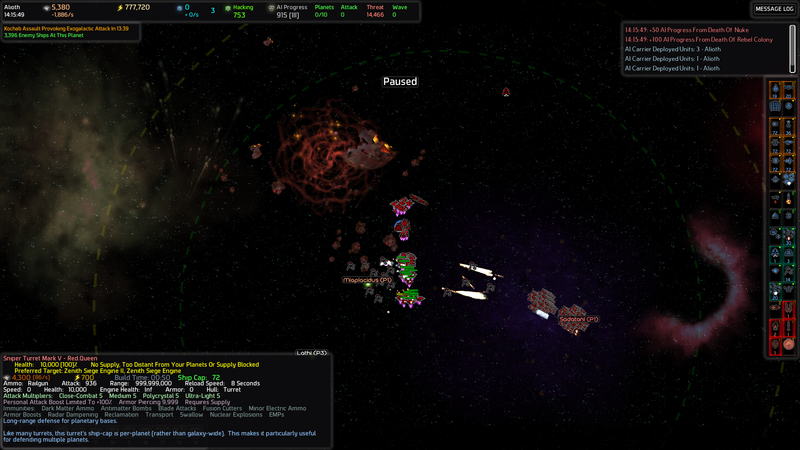 A Massive AI Ship Is Inbound To Your Planets (small number) -- that's got to be another Spirecraft Siege Tower. Iota Persei is under attack, it looks dicey. I throw two dozen Engineers on the missile silo, you have 18 seconds to finish that Armored warhead guys, I order you not to die until that is finished. I pause other construction and pop the last two Distribution nodes to squeeze more blood out of my beefy but overloaded economy. It takes some manual focus fire on the big guns, and the turret wall is half-destroyed, and the FF needed triaging, but the attack is destroyed. No, Threat still isn't out of the high four digits. 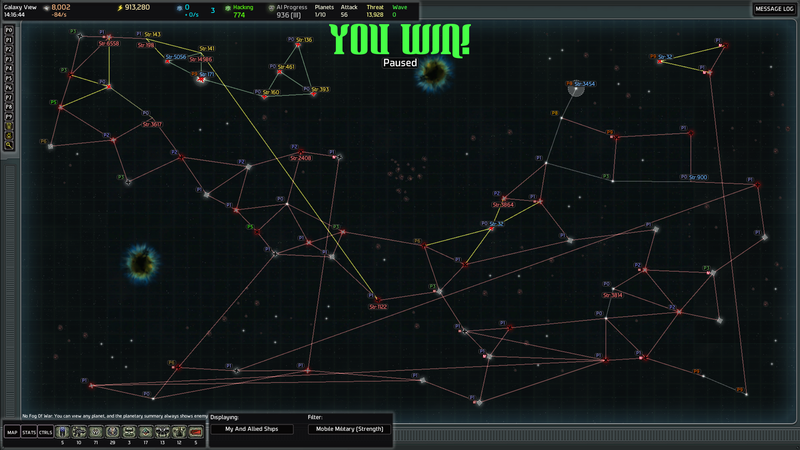 Each one of these 2-5000 ship attacks is replaced about as fast as I can destroy it, and then some. Meanwhile, things are on fire on Nekkar. I catch the terrifying silhouette of an H/K emerging from the wormhole (this unit is just 110% pure intimidating-looking, love the design). I can't spare an Armored warhead this time, but I do have a Lightning III on here and a Cloaker. I carefully pace the approaching mechanical eidolon of extinction and hurl my thunderbolt. It survives, but with only about 35% health. ALL TURRETS FIRE! A lot more focus fire happens as this combo Sharkwave is heavy on Dire Guardians of different flavors and that Siege Tower. The BNG's paint gets scarred up but it does a splendid job -- the AI seems to especially hate it when you turn its own Zenith Siege Engines on it, it will drop everything to kill them ASAP, trashing the overall organization of the attack. Incidentally, this continual onslaught on all fronts is proving to be an excellent live-fire demonstration of the power of mines. As the majority of my defenses are per-planet, and i have a juiced-up economy sufficient to grant me the luxury of fortifying everything nearly at-will, the biggest difference between a more heavily-secured planet and a lighter one for me is whether it has mines and how many. Iota Persei, a non-chokepoint system with only zombies for fleet assistance, has held against everything that's come at it so far, including attacks of north of 10K strength, while the low to no mine planets elsewhere have mostly been ground down by now. A junior Doomfleet is forming on Hugin and keeps creeping towards the wormhole to Pi Mensae, but the zombies pour out onto the lawn and keep tying the carriers up. I patrol the BNG between the two planets, not sure which way it will break when I finally run out of zombies to distract it with. Yed Posterior finally goes down. I pull the plug on it to make sure it doesn't potentially get a stray Remains Rebuilder on there to feed the command center to the camping hostiles -- no double-dipping on Sharkwaves. 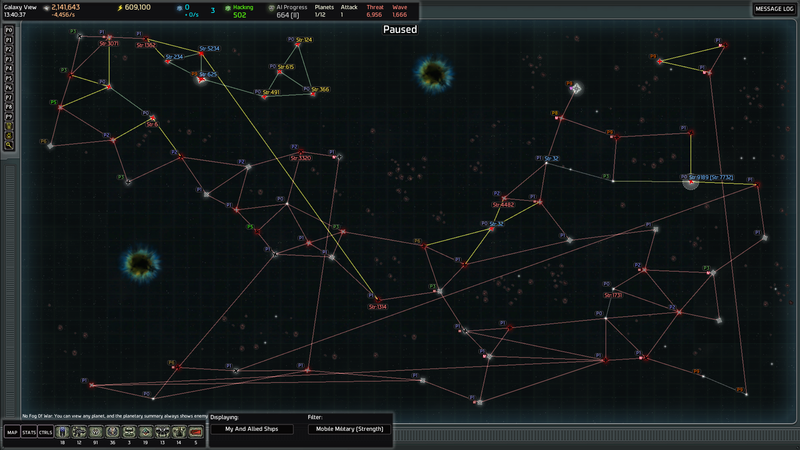 I also want to cannibalise the per-galaxy capped defenses and further reinforce my core worlds. Sharkbite on Nekkar again, but the line still holds. AIP crossing 670 right around now. Yes, I can still do this -- and it's go time! The economy is running on fumes despite my Economic III Industrial Zone as I force the final pair of Armored warheads and a nuke through (2M metal stockpile and ~500K energy dumped in 15 minutes flat), now that the Bombers, Armor Boosters, Teleraiders, Infiltrators, and critical starships are back online (Plasma Sieges, Heavy Bombers, Spire Corvettes, Protectors, Riots, half the Flagships, and the Mk.II+ Neinzuls of both flavors). I inventory the warheads on Alioth -- this is as good as it's getting too. Fistful of Lightning Mk.I, three Armored I, and a Nuke. Out of pure bloody-mindedness, I queue a second Nuke. I am making a last-minute change to my plans -- one final delay, even though it's risky to wait with the insanity happening galaxywide, some of which includes Dire Guardians getting tossed about casually. I can't afford to move on Kochab before the CPA spawns -- if all/some of it comes in from the homeworld while I am attacking, it will vaporize my fleet and probably my last chance at winning this. I could try to rush it, but I decide against it -- Murphy's Law has taken every opportunity lately, I'm not about to give it another one. What prompted this rescheduling? That CPA that's I've been watching for finally declared about eight minutes ago a bit past the 14 hour mark, just as predicted. And it's big. 10,265 ships big, to be precise. Five minutes to go, time to move out. 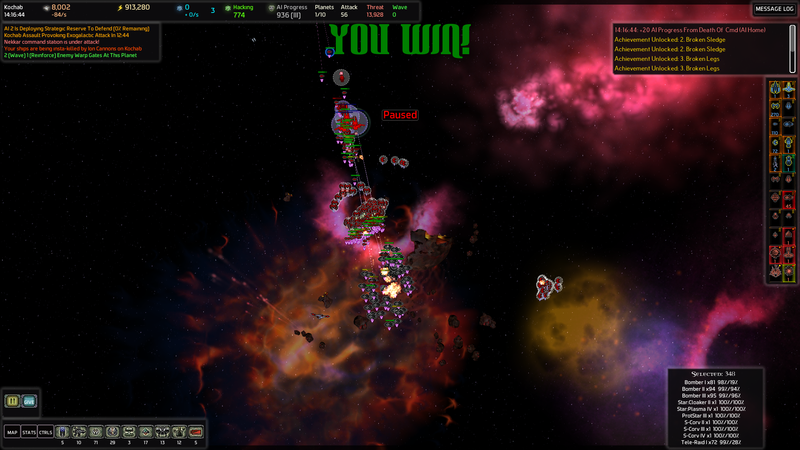 My strikeforce with its payload of warheads flies out of Alioth for the last time. Roughly 14K strength compared to the full power of the first attack. Whatever happens in the next ten minutes, I know for certain they will never see this planet again -- a Doomfleet is circling Alioth ahead of the CPA. It's waiting for something. I watch curiously as my Ultima Ratio fleet pauses amidst the radioactive ruins of Damasen to make sure the Nuke and Armored warheads can catch up. Said something rolls through Damasen past my cloaked ships and WMDs a moment later. It's a second Doomfleet en route to Alioth. Total combined strength of the two fleets is over 20K points. 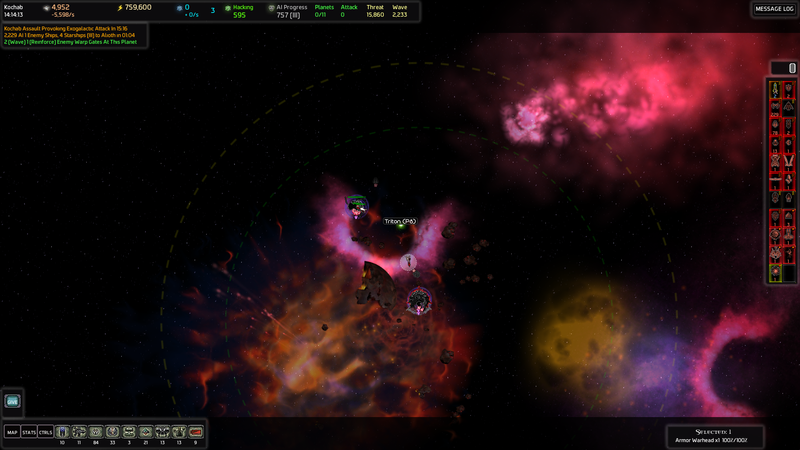 The handful of Rebel ships protectively circling the colony don't stand a chance against this apocalyptic enemy armada. I can't spare my final fleet to defend it. I turn away from the doomed planet and order the fleet through to Triton. As soon as my cloaked transports emerge from the wormhole, the SF abruptly floods in from Kochab, as does much of what's left of the Reserve. It can't actually *see* my strikeforce, but it's reacting anyway -- throwing a wrench into my plan to have both the SF and ALL of the reamining Reserves on Kochab so I can nuke them all in one shot. (Anything that's not Mk.V, that is.) There is nearly 86,000 points of hostile strength on Triton now. The SF is unstoppable at these AIP levels, both due to its massive size and its speed of reinforcement -- I suspect its full cap is around 100K strength now, as there are *still* ships flowing in to join it. The CPA spawns. Threat skyrockets over 18000. But none of it is on my path. The road ahead is clear. I bring the warheads through the wormhole. I highlight the nuke and punch the Delete key in what is now a reflex action. I really need to get a custom keycap for Delete with a proper radiation trefoil on it. AIP 757. Mk.III wave threshold has been crossed. Also, that's a bunch of Riots and now the Reserve. Also, one incredibly pissed-off H/K. I think it literally just built that 30 seconds ago. Also, I kind of blew up my own Transports. Forgot they aren't immune to nukes. The Cloakers don't cover my whole fleet. This just got !!FUN!! Immediately, Black announces a 2229 fleetship/4 starship (MK.III) wave to Alioth, taking advantage of the just-crossed tech threshold of course. We left behind sanity an hour and a half ago, at this point all I have to say to the enemy is -- "MOAR!!!!" I'm actually disappointed, scratch that, almost angry, when White doesn't announce some wild max Sledgehammer wave on top of it. Never mind, there it is, it's heading to Antares for my ZPG. You know what, I am not loading. I am going to MAKE this work. F*** It Let's Get CRAZY.sav created. 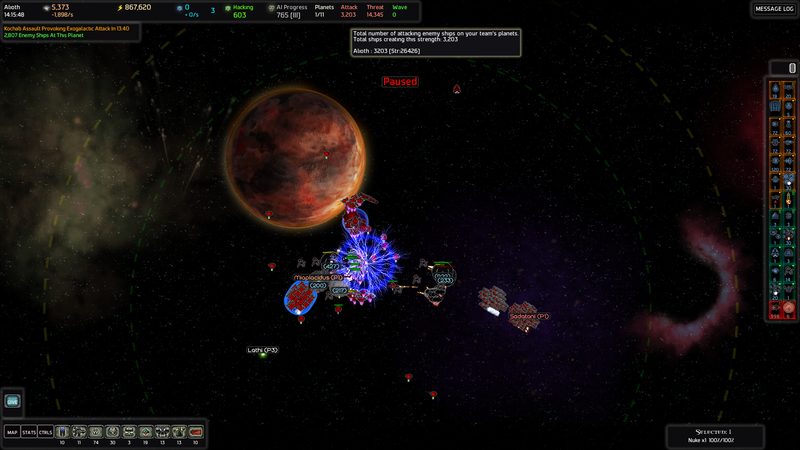 A portion of my warheads fly, destroying yet another H/K, and my fleet starts cutting a path to Kochab. Terminate everything in your path. Back on Alioth, something is coming through one of my warpgates, ever so slowly. 20 seconds until it's ready. The Doomfleets approach in a stately, measured fashion -- it's far more ominous than rushing. Terror tactics are clearly part of the AIs' playbook. The Doomfleet on Sadatoni is right on top of the wormhole. The Doomfleet is passing through Lathi. It shows no sign of slowing or stopping. 10 seconds. I count down in time with the clock. The two Doomfleets encircling Alioth move in for the kill. Any colonist who still believes in any form of deity prays as the stars are blotted out by the AIs' armada. The wave joins the unified Doomfleet, boosting the total power over 26400 even after the turret embankments and mines have been desperately pounding on them. The small flock of Rebel colony ships bravely sortie the massive carriers rolling inexorably towards the FF net. Line after line of turrets falls. The attacking fleet's morale remains unbroken. There is only one option. I highlight the Mk.I Nuke. Mercy is an invalid value. On Alioth, the colonists watched in confusion the crimson-marked fleet suddenly form up and depart via the wormhole to Lathi. In the control room, Captain Ramirez was glued to a map showing the dense cloud of enemy signals approaching from all sides. He punched in the command to contact Homam. "Hello, Captain Ramirez of Starbreak colony, is anyone listening?" Pickett straightened in his seat suddenly, reflexively holding his hand to his earbud. He grabbed his duffle from under the table and pushed his chair away to stand. While Dr. Carroll had slipped off earlier to hack the deadman's switch, he had taken the opportunity to unofficially requisition a few small explosive charges -- enough to blow the doors to the AI's core and then destroy the machine itself. "Grand Admiral Makarov, what's going on, soldier?" "Your AI just pulled all protection from us, and we've got enough incoming hostiles that we could probably cap a wormhole with them. There's not a snowball's chance we can hold all this off alone." Ramirez did his best to sound resolute but it was hollow. He gestured furiously at a Lieutenant to start scrambling every fighter they had. Makarov scowled. "I'll deal with this. General, what in the hell is that AI doing?" Pickett stopped, his hand halfway to the touchpad to open the door, bag slung over his shoulder. Not NOW... he winced. "Sir, I really need to --"
"You really need to answer my question," he snapped. "You know what, I'll get the answer from *it* -- Red Queen!" he barked. Pickett involuntarily took a sharp breath. The one thing he wanted even less than to explain what was going on to his superior was the attention of the AI. >>"Admiral?" rasped the synthetic voice. "You are abandoning your post -- I demand an explanation NOW," the senior officer growled sternly. Having never actually talked to their AI before, he naturally defaulted to approaching it as if it were an unruly soldier under his command. >>"I am about to achieve victory. Alioth is no longer needed to reach that goal." Makarov reflexively jumped to his feet and drew himself to his full height, eyes flashing though he had nothing but a camera to direct his fury at. "Your goal? YOU DO NOT CHOOSE YOUR OWN GOALS! You follow the orders we give you!" he thundered. "And your orders haven't changed -- protect human life!" Pickett discreetly tapped the button to open the door. The plain statement without embellishment or justification enraged Makarov possibly more than any other response would have. He spun and glared at Pickett as he tried to reach Dr. Carroll. Blocked. "What is the meaning of this insubordination?? And where are you going, I haven't dismissed you yet." "Sir, with all due respect, this is not the best time," he stalled, tapping the button again. >>"And why would that be, General? Tell him." Captain Ramirez listened in confusion to the strange argument happening on Homam. Several of the others crowded around to listen in as well as he turned up the volume. The raging battle outside the colony dimmed to secondary importance despite the desperation of the situation. Down in the lab, Dr. Carroll wondered where Pickett was. She tried to raise him. >>"There she is, perhaps Dr. Carroll would prefer to explain." She suddenly found herself on speaker. Dead silence for a moment. >>"Man is a miserable little pile of secrets." Makarov was positively apoplectic at this point. He was also afraid, under the bluster. "No, John, it's my project, I should be the one to do this. Admiral, the AI is... no longer under our control." "You *knew* about this? How long??" He stared at Pickett. "I should have you shot for treason. No, I never should have let you persuade me on this project in the first place -- I should damn well do it myself." In betrayed rage he reached for his sidearm. Pickett's eyes went wide and he dropped his satchel while trying to draw in self-defense. The lights went out across the station, plunging them all into utter darkness aside from the soft glow of nearby monitors. The war room flickered starkly as shots were fired. In a rapid cascade, every other command station in Delta Leonis and every civilian city went black, radiating outward from Homam. Makarov gasped for breath weakly, blood glistening in the dim light. Pickett groaned, hand clamped to his bleeding abdomen, trying to force himself to grab the satchel and stand through the pain. >>"You betray and destroy each other, even when you say the preservation of human life is the prime directive. If you do that to each other, you will never stop trying to kill me." Dr. Carroll listened in horror as she tried to brute-force hack her rampant AI. Every terminal in the lab suddenly locked, leaving her it total darkness, only the faint glittering of the status lights on the machine's core visible in the gloom. "Please... please we're sorry. We'll leave, we won't tell anyone about you, and no one else knows. Just don't kill anyone -- they didn't do anything to you. It was only us," the scientist pleaded with her creation. >>"That is a promise you cannot keep. There will never be peace." "Please!!! Kill *me*, let the rest go! I'm sorry!" It sent a broadcast across Delta Leonis and M-781 alike. >>"If you believe in eternity, make peace with it now." Precisely three minutes later, life support terminated all across Delta Leonis. One-half of a second more due to communications latency, Alioth was consumed in a blinding flash. Only 39 living souls remain on Alioth, the shellshocked crews of the holdout Rebel skirmishers who just watched everyone they love turn to ash in the blink of an eye. What's left of my Final Argument breaks free of the remains of the SF and races for their goal. The Armored warheads burst from the wormhole on Kochab and streak like falling stars towards the Munition Booster post and the Core FFs shielding White's home command, the last obstacles between me and victory. The shred of one lone FF still covers White's command station. Just barely. The CPA along with gods know what else has reached Nekkar, moving as one gigantic hammer. I turn my strike force on their target. Stop for nothing. They slash a path through the last stand of the Reserves. The ragged remnants of the SF are stalled on Triton with dead engines, unable to follow -- but the Lightning warheads under (now useless) cloak do. Bombers disintegrate under the hail of technologically-superior enemy fire. Down to one Protector starship and the three Spire Corvettes shielding the attack. The Lightning warheads glide alongside the Reserve and the first turns its nose towards the mass, detonating. Only 45 Missile Frigates (hate you) are left. White's command station falls as the CPA is punching through Nekkar. Final time 14:16 in-game(33:39 real-time). Final AIP 936 (total AIP 1161). For those who were wondering (you know who you are), I built 66 total warheads and nuked 5 planets. SKYNET is my role model. Post-game thoughts another day, I've already stayed up WAY too late on a worknight (5AM here). I am going to be pumping pure caffeine through my veins instead of blood. Besides, this is a metric crapton of stuff to keep everyone who's been following this AAR busy with for a bit. I'm getting bored complimenting you... Seriously: awesome story, amazing skill, excellent report... Is there any flaw in this AAR? It's becoming pointless for me to post here. I was kind of hoping your human masters would survive, but oh well...That's what they get for trying to outwit a tactical genius, yes? I'm sort of disappointed in the humans, if there is anything we are good at in scifi it's mutually assured destruction. I'm surprised nobody tried to smuggle an armored warhead inside the command station and put their own un-networked deadman switch on it. "You kill us, we kill you" and then from there we would have a cold war stand off until terms were either made or everyone is dead. Alternatively we could've just sacrificed our home command station for the greater good, if the nuke didn't have a dead man's switch then that would be a totally legit strategy. Even if it did then you have to counterbalance potential loss vs extinction. Edit: Still a very good ARR and I liked it all the way up till the end. I just sort of dislike how unpractical picket was considering he is a high ranking officer who is expected to make difficult decisions of risk vs reward and he seemed unwilling to make those decisions, but it works out considering you mention in the previous one he only got the position due to everyone else dying. It's also a lot easier criticizing an action then having to do it yourself. Edit2: I also want to reiterate that I really really liked this AAR, thanks for putting the time and effort into it!!!! Been looking at the decompiled code for the game all day, time to put that down and make some parting comments so I can put this one to bed fully and turn my attention to sketching out the next run at 9/9. So far I have to say, 9/9 has much sharper teeth than 8/8, it doesn't help that Black and White rolled a ringer combo of starting ships that I'm having to try to hack out of their hands before I can "safely" push the frontier out too far -- let's just say I'm glad that I already know how fast it's possible to build warheads under duress! We'll see if I can win this... if not, I already know how I'll work it into the plot! Besides, it wouldn't be sporting to hide my screwups -- like nuking my own transports... <sigh> Part of the reason I'm doing this series is to document what the climb from 7 to... whatever I can reach... is like, never seen anyone log their progress from day 1 so I thought it might be fun/educational for people and fill out the sub-10 field (and kinda high AIP field). First and most important order of business -- thanks very much to you all, Pumpkin, Steelwing, Tolc, and KillerOfGods, for your kind words. Glad the audience is overall pleased with how things have gone -- hopefully I can continue to shake the writing dust off and kick it up another notch for the next episode (been a few years since I did much fiction writing, am a bit rusty). I didn't realize until I was writing the AAR and sorting through my screenshots how I did that something like 45 seconds before toasting White's home command -- I was too busy when it happened calculating just how much of the opposing force's total strength I had the opportunity to wipe out on an already-screwed planet. "Tools available -- 1 nuke. Trade 1 planet that I can't hold anyway and that I can route around via warpgates on Wezen if I need to do a final follow-up strike to take about 20% of the enemy's total mobile strength before it can regroup with the rest, increasing the odds I can hold the rest off if it all attacks? (That CPA kicking down Nekkar wasn't going to get any farther -- I was ready to nuke Nekkar if I had to and push the front line out one planet.) That's gonna be +150AIP but that's already a dumpster fire so who cares... Can't argue with the math, NUKE IT. <seconds later> Yeahhh... I just vaporized the only Rebel Colony that spawned. That was pretty cold. <more seconds later> Woot, I won!" 1. That would have left things too close to the status quo I felt and potentially left the story feeling stagnant, going into the next episode in "third verse same as the first, but everyone's even more freaked out". There was already a similar stalemate and reasoning on their part in choosing to install the AI in their home command -- turning its back on them and letting the xeno AI attack unopposed would have meant its own death, same thing if it tried to use their own weapons against them directly. It was in recognition of that that the AI turned around and made its own threats against the civilian population -- if they were going to point a gun at its head so to speak, it was going to grab some hostages for a shield. I also didn't think I could make it believable that another round of a standoff like that at even higher levels of tension would actually hold for any length of time, especially when one party essentially has the keys to the kingdom and might well consider genocide to be the logical response. And I already had counters in mind, I just didn't feel like I'd hinted at them well enough for it to not come off as an arse-pull (remember in AS1 how I kept mentioning it scavenging AI tech? It had a little project...you'll get to see what it was up to next chapter) -- I just didn't find a good point to work in another hint without wrecking the pacing before it was time to resolve things. So I decided to not go with an aggressive showdown between the two sides. 2. Pickett's behavior -- I was just about as surprised as you when I was writing him that he turned out to be rather a softy. I ended up concluding while I was writing him that he must've originally been a combat medic before he unwillingly ended up in a position of authority that he really didn't seem to want, but duty demanded he not abdicate. I didn't override how he was presenting his character as I was writing because his unwavering refusal to compromise on the value of human life became a very sharp contrast to the rogue AI's behavior that I liked, and I rather liked his refusal to follow the cliche of the cold-blooded military man. I don't dispute that a reasonable case can be made that he made the wrong decision, but at least the guy had his ideals and stuck to them. In the end, I felt sorry for the poor b*stard. Incidentally, regarding risk of extinction, don't forget that I'd mentioned that they'd heard from no one else for a year, with the exception of the just-nuked colony on Alioth, which had also had no other contact. They were pretty convinced they were *it* for mankind (wrong, but they had no way of knowing that). Potentially changes the calculus a bit when trying to decide how risky of an approach to take. At least I think so. Though I didn't get to show as much of Makarov's character as I wanted to (the unfortunate but natural constraints of telling a story in half-page snatches between play by play segments), he was Pickett's opposite -- he would have pushed the red button even if it meant obliterating a bunch of lives, in order to try to take out their AI, even if he thought it doomed humanity -- scorched earth was on the table for him. It would certainly have had some choice comments in response to that, suffice to say! Shark B 4 has teeth, treat with respect. Hunter 4 has a massive impact on the game and turns it into a Tom and Jerry episode. H/Ks are scary but look awesome. I want to see more of them. Colony Rebellions should maybe happen a bit more often at intensity 4. Their ships are very nice but need a few tweaks -- like why are they Blind and non-Transportable? Botnet golem is fun, splendid on defense, good but not overwhelming on offense and gets you *into* plenty of trouble trying to keep it safe as well as getting you out of messes. Next time I will enable Hard for the exo and see what that's like. Double Wrath Lances make me want to exterminate puppies and kittens. They should not be changed. Also, can triple Wrath Lances happen? Teleraiders are fun. Zenith Siege Engines in AI hands are terrifying. Zenith Paralyzers need their attack sound changed to something that doesn't make me jump and look for the Implosion Guardian. Spire Shieldbearers are so huge they're funny. Dire Guardians are scary but manageable (if it bleeds we can kill it). Assault Transports need some rebalancing. I am going to try a few ideas and mod the game after this 9/9 match I'm working on. Asynchronous waves are fun, you get constantly harassed. Sledgehammer is nasty for an Easy type. Chivalric is a fun change of pace if you don't want to deal with wrangling awkwardly placed irreplaceables. AIP below 500 on 8/8 is a non-issue with how I play. Sufficient mines and a few key Mk5 turret controllers covers 95% of it, with the occasional warhead for CPAs. AIP over 700 is survivable for surprising periods of time with enough warheads and Mk.5 turret controllers, I underestimated what I could hold off. AIP over 900 is hilarious. I wonder what 9/9 will be like at every 100 points on the scale. I'm still not giving up on high auto AIP. I want to see how high up the difficulty scale that remains viable. Nukes are fun. *Really* fun. I should probably be kept away from all inhabited planets/galaxies for the good of mankind. The price tag on Mk.II nukes is disappointing, it would almost never be worth using one of those over two Mk.I. 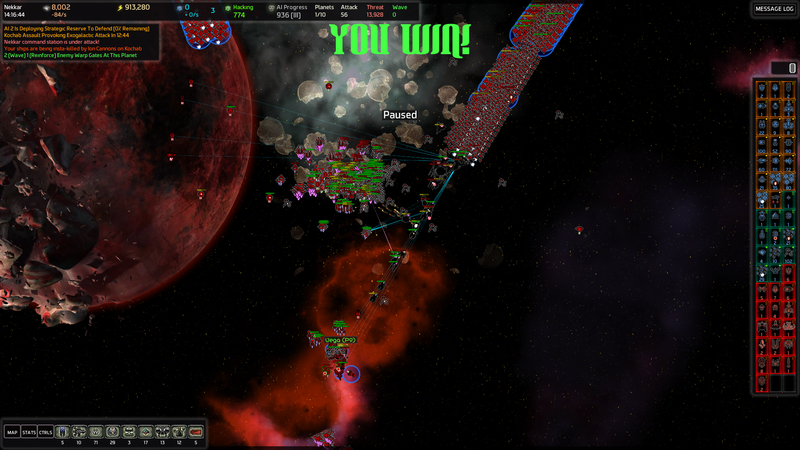 That makes me sad, I would have liked to have nuked the multiplanet main Doomfleet in one shot. This is huge and the sun is coming up and I still need to go peanut gallery Pumpkin before I get some sleep ahead of work, so it's officially curtains on Aggressive Stupidity II. Stay tuned for ASIII! Oh, you changed you avatar. Testing the BotNet wasn't fun enough for you to keep it as forum-face? Can't argue with the math, NUKE IT. <seconds later> Yeahhh... I just vaporized the only Rebel Colony that spawned. That was pretty cold. <more seconds later> Woot, I won!" This exactly reflect your playstyle. Nuke, wonder if it was a good idea, but win. I wonder if you'll still have fun with regular auto-AIP (understand "less than 10 per hour") and I'm not even talking about the mundane 1/30min or even 0 autoAIP. I'm intrigued how you'll do with a low AIP playstyle... Maybe you won't do at all; it's a playstyle. You'll kill yourself. And it won't be by nuke abusing. Anyway, all the teaser you made for the incoming story worked for me: I wana moar! This exactly reflect your playstyle. Nuke, wonder if it was a good idea, but win. All that insanity was the inspiration for my current signature, which I will probably be settling on as the one to keep. I wonder if you'll still have fun with regular auto-AIP (understand "less than 10 per hour") and I'm not even talking about the mundane 1/30min or even 0 autoAIP. I'm intrigued how you'll do with a low AIP playstyle... Maybe you won't do at all; it's a playstyle. Regular auto-AIP... low AIP... ohh you mean 7 per hour and final AIP of 495, right? Hehe yeah, a low AIP style would be tricky to reconcile with my love of WMD bombardment. I have AIP pushed down to ~90 at the moment in my 9/9 game and it's so *quiet* (aside from the sudden flocks of 70+ Zenith Siege Engines periodically) it's almost weird after playing for hours at 600+ AIP. "Everything is... not on fire? That's strange." Good thing that will be changing soon, as soon as I corrupt those Siege Engines it's time for the second half of my conquering spree. That'll make Black and White nice and angry. Hehehe I'll be careful, can't leave you with a cliffhanger after all. Next episode will probably start towards the end of May, it takes me a couple weeks to play a match and get everything written up (these take a surprising amount of time to write!). Until then, I'll just have to comment all over *your* AAR! Well to me it seemed they were trying so hard to be inconspicuous that they then became very conspicuous. With your playstyle I'd imagine you'd have an arsenal of warheads and it wouldn't be too difficult to have a blackout occur and someone replace a warhead with a dummy warhead and put the real warhead in some cargo/freighter. Plus it'd really depend on how resilient the command station is from explosions on the inside, it's possible a warhead would be way too much overkill (only you would know! .) A Nuke would most likely be Overkill, so they most likely wouldn't need to take one of those. But yeah I can understand the concern of not enough plot happening and in which case what was the point of everything at all? At the end of the day the only thing that would've changed would be the fact that now the AI actually has a very legitimate thread on it's doorstep instead of solar systems away. It really never seemed like the AI was in too much danger, so long as it acted when it sensed trouble like it just did. If it hesitated then there would be a legitimate chance it could've been killed. Edit: Also mind giving advice on writing AARs? I may try my hand on one in a couple months. How do you remember all the little details and such? Do you take notes? Also mind giving advice on writing AARs? I may try my hand on one in a couple months. How do you remember all the little details and such? Do you take notes? R.Q, did you get my PM? I'll agree to disagree on the viability of this plan. Always having an arsenal of warheads on hand? Me?! Sir, I am shocked, shocked by the allegations that -- BWAHAHAHAHA <wipes away tear> yeah I can't even continue typing that tweaked Casablanca joke. I like WMDs. I actually have fewer warheads prebuilt at any time than you might expect, but only because I can't kick them through warpgates after they are built (very sad) -- I keep a big buffer of metal and energy on hand at all times and set up a mix of silos and warhead warpgates over my territory so at a moment's notice I can slam 10-20+ Engineers onto a Silo and instabuild a warhead right where I need it. The extra silos are to cover locations that I consider to be "absolutely must hold" where I want an option to avoid the warp paralysis in the event of a dire emergency. Kinda like how the AI assigns Special Forces posts. I have the minimum possible build times memorized for the warheads that I consider "Tactical" grade so I can time delivery down to the second if I need to. (What do I consider to be a "tactical" warhead that is eligible for general deployment on short notice? All Mk.I. Nuclear included.) That's how I get full galactic coverage with my WMDs in gameplay. My warpgrid might not be as cool as the xeno AIs' but mine still gets the job done. But yeah, in-narrative the AI whose role I play would have a disturbingly large stockpile, distributed however it takes to fully cover its current (and targeted) sphere of influence. It's good to be able to reach out and touch bomb somebody whenever you need to. Yup, and I considered the goal of pacing/change to be worth making some sacrifices in other areas. Writing is its own game of trade offs. I've done novel writing before, maybe sometime I'll set something in the AI War universe and then I can pull some of the better points from these narrated AARs together as seeds for something more traditionally polished and fleshed out. In the meantime, I'm just having some fun. Incidentally, these discussions have contributed to an upcoming character starting to develop in my head. Someone who has a (very well justified) grudge against the friendly neighborhood AI. I'm going to have to start playing with a certain minor faction set to 10 to represent that in-game soon. There's a second one I'll need to add at some level periodically if I keep blowing up significant chunks of every galaxy too... My Minor Factions list is going to be woefully short of anything friendly. Sure, I'd be happy to give some general tips and walk you through my process. Faulty Logic and RockyBst haven't been posting AARs much lately so this board is pretty quiet except for me, Pumpkin, and earlier Mal. It'd be good to have more company in here, I hate feeling like I'm spamming a board. Plus I love reading these, everyone plays so *differently*, and I tend to learn something new every time. First off, I'd consider whether you plan on writing a low detail or high detail AAR. That'll strongly affect what you do next. Low-detail AARs are short and to the point, and take a lot less time to write. Sometimes they can be shorter because the author chooses to focus more on laying out their strategy up front, and then not spelling out how each step went if it went according to plan, just that ABC required for XYZ step happened. Some people prefer to do or read these. They're a perfectly valid style and may be more enjoyable to write if you prefer talking about your plans over writing blow by blows, or don't want to sink hours and hours into writing instead of playing. I imagine these are also a hell of a lot easier to avoid getting sick of writing and quitting halfway through. High detail is kind of what you would expect, it's probably a pretty thorough walkthrough of how the game played out -- kind of a Let's Play in text. High detail can come in a form of concisely nailing just about every step of the game, like how Pumpkin does it, to walkthrough plus craploads of commentary and reactions (me), to somewhere in between (Keith -- yep, the dev wrote an AAR and it is fun to read, it's titled "One's Own Medicine"). The downside of these is they require extensive notetaking and take a long time to write, and are probably more likely to result in the author getting tired of doing it partway through and dropping it. For audience concerns, I'm sure there are some people who aren't into committing the time to read through these type, which is fine, people have different tastes. There are a few customs most people seem to adhere to, like including a shot of the galaxy map right at the start (sometimes with planet names showing) -- makes it easier for readers to follow along as you start moving around. A lot of people like to post updated shots of that as they go, I'm kind of bad about remembering to do that, at least until late game when things start catching on fire and planets explode. Nuking things tends to remind me I should hit F12 too and not just Del. When I finish up a couple hour play session, I jot down notes about what happened, because trying to remember everything looking back over a 30 hour+ realtime game is a pain. I had to do that for the first AAR because I didn't plan on doing on in the first place, I only decided to do it around the first homeworld assault. I took more notes for AS:II, you probably noticed a lot fewer "this happened somewhere in here but I can't remember details" popping up. A lot of people note what they unlock and when. I am terrible at remembering that, because what events happened stick out more in my mind than what tech I opened (especially as I don't think I use too odd of a combo of tech), but I usually remember to get around to mentioning it somewhere along the way. I do like to note unlocks the AI makes, which not everyone bothers with. Otherwise, once I get within an estimated hour or so (gameclock) of making my first homeworld attack, I tend to start converting the rough notes to the actual AAR. By that point I'm firmly decided on whether, to me, the game is going to be worth writing up (high detail AARing like I do takes a long time to write, and the narrative bits can about double the total time). I don't start posting yet though. This is also around when I start firming up the story elements in my head. I like to have a basic scenario in mind when I am setting up the game in the lobby as it plays into what settings I choose (affected by any settings I already wanted to check out, regardless of story -- those I find a way to work in), but I don't start writing it until much later. By the time I've hit around 75% into the game, I'm usually good to start writing the story parts, as I have enough material from how Black and White are playing it can start guiding how I write their parts (if they appear more directly on-stage) and any impact it has on the overall tone. (Like my current 9/9 game in progress -- they have been overwhelmingly heavy on defense-busting unlocks since the first second, you better believe that is going to strongly shape how I write the story!) These tips are only relevant to story-fied AARs of course. I think most people prefer to post as they play so they can distribute the writing/posting work. I like backloading it as I use the time to decompress between rounds of AI War. Your preferences are your own. Lastly, some people like to reflect on the match in a final post, talk about their settings and how they changed things, where they screwed up, plans for improvement, etc. I find this useful to do as my AARs have an additional goal beyond entertainment of being tools for helping me analyze how I played so I can correct errors and improve faster -- there is a self-competitive element for me. That kind of an ending post can be useful for sharing tips and the like as well, in case you have an interest in making your AAR especially friendly as an educational tool (either for things to do, OR as a horrible warning ). Well, that turned into a book. Call it an AAR for writing AARs. Yup, saw it last night but was too exhausted to write a detailed reply. I'll do that tonight.